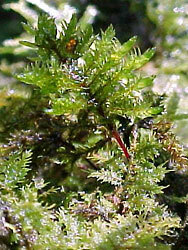 More than 95% of moss species belong to the Bryopsida. Diversity in this group has been classified into 90 to 110 families and 11 to 16 orders. The Dicranales and Hypnales are the most diverse groups with 13 and 44 families, respectively. The most important characteristic of the Bryopsida is the architecture of the ring of teeth (peristome) surrounding the mouth of the sporophyte capsule (Figure 1). Bryopsida are the only mosses that have an arthrodontous peristome, i. e., a peristome in which the teeth are structured by articulated cell wall remnants (see Characteristics). Figure 1. Closeup of the peristome of the capsule of Sematophyllum (Hypnales). This arthrodontous peristome is composed of a double ring of teeth. 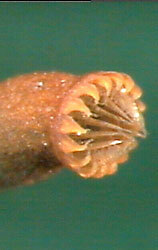 The external teeth (exostome) are shorter and thicker than the segments of the internal row (endostome). Note that each tooth in the exostome is alternated with a segment of the endostome. Image copyright © 2000, Efrain De Luna. Despite all orders sharing a basic arthrodontous peristome, the Bryopsida comprises a diverse set of species of various gametophytic morphologies. Branching systems combine pinnate (monopodial) and stepwise extension of new branches (sympodial architectures) with apical (acrocarpous) or lateral (cladocarpous and pleurocarpous) sporophyte locations. Leaf cells are variously differentiated forming specialized groups at allar, basal, medial, upper and apical leaf zones. Leaves in some taxa are multilayered stratose, at least in the apex and margins. The sporangia also show a wide range of variation in shape and size of the capsule, operculum, and peristome organization. The outer surface of teeth can be variously ornamented with papillae, striations, or both. 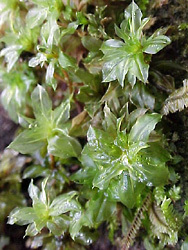 All of the features of the gametophyte (protonema, gametophore, gametangia) and sporophyte (seta, sporangium and peristome) described for the Bryophyta are applicable to the Bryopsida. Here, the basic patterns of variation in the peristome requires special examination, since it provides most of the characters for the classification at the ordinal level in the Bryopsida. Each tooth of the arthrodontous peristome type is composed of periclinal (tangential) cell wall remnants between two of the three concentric peristomial cell layers: the outer, primary, and inner peristomial layers (OPL, PPL, and IPL; Figure 2A). Often, a double ring of teeth is present surrounding the capsule mouth (Figure 1). The external ring of teeth is formed by the tangential walls between the OPL and PPL; it is collectively known as the exostome. The internal row consists of the cell wall remnants located between the cell rings of the PPL and IPL, therefore the row of segments is known as endostome. Depending on the number of cell columns articulated to form the length of a tooth, two primary types of arthrodontous peristomes are known: diplolepidous and haplolepidous. In diplolepidous peristomes two columns of adjacent OPL cells participate in the formation of an exostome tooth (Figure 2B, D, E). A medial vertical line marking the two cells can be observed along the outer surface of each tooth. This type of peristome can be observed in taxa of the Funariales, Bryales and Hypnales, among others. In haplolepidous peristomes the exostome is missing, but the endostome is well developed and strongly thickened. The outer surface of an endostome segment is made up of just one column of cells from the PPL (Figure 2C). The haplolepidous peristome is characteristic of the Grimmiales, Seligeriales, Archidiales, Pottiales, and Dicranales. Figure 2. The different peristome types of Bryopsida. A. Cross section of an embryonic sporophyte capsule. B. Diplolepidous opposite peristome (Funaria type). C. Haplolepidous peristome (Dicranum type). D. Diplolepidous alternate (Orthotrichum type). E. Diplolepidous alternate (Bryum type). Drawings copyright © 2000 Efrain de Luna. Two basic peristome "types" have long been recognized in the diplolepidous mosses: diplolepidous-opposite, and diplolepidous-alternate. In diplolepidous peristomes usually both the exostome and the endostome are present, but in several families the endostome is lacking or reduced. When the two concentric rows are present, each external tooth can be directly opposite or alternated to the internal segments of the endostome. In the diplolepidous-opposite or "Funaria type", the anticlinal walls of the IPL and PPL are almost perfectly aligned (co-radial), so the endostome segments and the exostome teeth are opposite each other (Figure 2B). This peristome organization in found in the Funariales. In the diplolepidous-alternate or "Bryum type", anticlinal cell divisions in the IPL are asymmetric, producing narrow cells adjacent to large cells. Later in development, the IPL ring shifts displacing the position of radial IPL cell walls relative to those in the PPL cells. This results in the placement of the endostome segments alternating with the exostome teeth (Figure 2D, E). 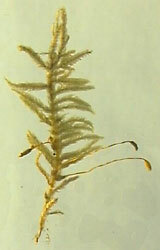 The diplolepidous alternate peristome is common in the Bryales, Rhizogoniales, Hookeriales, and Hypnales. The Diphysciales, Funariales, and Timmiales are the most basal lineages within Bryopsida, but these groups have a number of unique features that make comparisons difficult (Netwon et al 2000). The remaining orders are grouped in two large clades: the Dicraniidae consisting of the haplolepidous peristomate orders, and the Bryidae including the diplolepidous-alternate taxa (Figure 3A). The most derived clade within the Bryidae includes orders with ciliate endostomes: Bryales, Rhizogoniales, Hookeriales and Hypnales (Cox et al. 2000, De Luna et al. 1999). The Hedwigiales are interpreted as an instance of peristome loss, and it remains uncertain if they belong in the ciliate clade. Figure 3. Phylogenetic relationships within the Bryopsida. Orders in the Dicraniidae in green, orders in the Bryidae in blue. A. Tree from Newton et al. (2000, p. 195). B. Tree from Goffinet & Cox (2000, p. 218). C. Tree from Cox et al. (2000, p. 235). D. Tree from Cox & Hedderson (1999, p. 126, 132). E. Tree from La Farge et al. (2000, p. 265). F. Tree from De Luna et al (1999, p. 642) and De Luna et al. (2000, p. 251). As best estimates of higher-level moss phylogeny, recent cladograms of the Bryopsida still contain uncertain relationships for the Funariales, Encalyptales, Bryales, and Hedwigiales. The Funariales are very likely sister to the rest of arthrodontous mosses (except Diphysiales). This position is consistent in Newton et al. (2000, Figure 3A) and Cox et al. (2000, Figure 3C). However, another analysis places the Funariales as sister to the Encalyptales, and this clade is in turn sister to Dicraniidae (Goffinet & Cox 2000, Figure 3B). The apparent relationship of the Funariales to the Dicraniidae (as interpreted by La Farge et al. 2000, Figure 3E) is most likely because members of the Bryales were used to root the phylogeny. This topology becomes mostly concordant with the other five hypotheses of relationships in Figure 3 if it is rooted with the Funariales. The relationships of the Encalyptales are still uncertain. This group has been resolved as sister to the Dicraniidae (Newton et al. 2000, Figure 3A), sister to the Bryidae (Cox & Hedderson 1999, Figure 3D), or sister to the Dicraniidae , Bryidae clade (Cox et al. 2000, Figure 3C). Also the circumscription and relationships of Bryales and Hedwigiales still need further study. Polyphyletic status of the Bryales in several studies make it unclear how families such as the Bartramiaceae, Bryaceae, Mniaceae, and Hedwigiaceae are related to each other. Cox, C. J. and T. A. J. Hedderson. 1999. Phylogenetic relationships among the ciliate arthrodontous mosses: evidence from chloroplast and nuclear DNA sequences. Pl. Syst. Evol. 215:119-139. Cox, C. J., B. Goffinet, A. E. Newton, A. J. Shaw and T. A. J. Hedderson. 2000. Phylogenetic relationships among the diplolepideous-alternate mosses (Bryidae) inferred from nuclear and chloroplast DNA sequences. The Bryologist 103:224-241. De Luna, E., A. E. Newton, A. Withey, D. Gonzalez and B. D. Mishler. 1999. The transition to pleurocarpy: A phylogenetic analysis of the main Diplolepidous lineages based on rbcL sequences and morphology. The Bryologist 102:634-650. De Luna, E., W. R. Buck, H. Akiyama, T. Arikawa, H. Tsubota, D. Gonzalez, A. E. Newton and A. J. Shaw. 2000. Ordinal phylogeny within the Hypnobryalean pleurocarpous mosses inferred from cladistic analyses of three chloroplast DNA sequence data sets: trnL-F, rps4, and rbcL. The Bryologist 103:242-256. Goffinet, B. and C. J. Cox. 2000. Phylogenetic relationships among basal-most arthrodontous mosses with special emphasis on the evolutionary significance of the Funariineae. The Bryologist 103:212-223. La Farge, C., B. D. Mishler, J. A. Wheeler, D. P. Wall, K. Johanes, S. Schaffer and A. J. Shaw. 2000. Phylogenetic relationships within the haplolepideous mosses. The Bryologist 103:257-276. Newton, A. E. and E. De Luna. 1999. A survey of morphological characters for phylogenetic study of the transition to pleurocarpy. The Bryologist 102:651-682. Newton, A. E., C. J. Cox, J. G. Duckett, J. A. Wheeler, B. Goffinet, T. A. Hedderson and B. D. Mishler. 2000. Evolution of the major moss lineages: Phylogenetic analyses based on multiple gene sequences and morphology. The Bryologist 103:187-211. Page: Tree of Life Bryopsida. Mosses with arthrodontous peristome. Authored by Efrain De Luna, Angela E. Newton, and Brent D. Mishler. The TEXT of this page is licensed under the Creative Commons Attribution-NonCommercial License - Version 3.0. Note that images and other media featured on this page are each governed by their own license, and they may or may not be available for reuse. Click on an image or a media link to access the media data window, which provides the relevant licensing information. For the general terms and conditions of ToL material reuse and redistribution, please see the Tree of Life Copyright Policies.